Michael Perry Gerber, an Assistant State's Attorney based in Rolling Meadows, was appointed yesterday to the Lawrence vacancy in the far northwest suburban 13th Subcircuit by the Illinois Supreme Court. According to ARDC, Gerber has been licensed as an attorney in Illinois since 1980. Gerber's appointment is effective tomorrow, December 22, and expires on December 3, 2018. The Supreme Court presumably made this appointment on the recommendation of Justice Anne Burke. The Court never actually says---and trades do happen, from what I've been told---but this vacancy was announced by Justice Burke in October. Meanwhile, on Monday, Justice Burke announced a new vacancy in the south suburban 2nd Subcircuit, this one created by the retirement of Judge James L. Rhodes (the link is to the press release). Notice of the vacancy and details of the application process are posted on the Illinois Supreme Court's website at www.illinoiscourts.gov. From there, follow the instructions on the "Latest News" scroller announcing the Second Judicial Subcircuit of Cook County vacancy. Applications for this vacancy will be screened by a special judicial screening committee chaired by retired Supreme Court Chief Justice Benjamin K. Miller. Justice Burke established this screening committee in 2006. The Illinois Supreme Court yesterday appointed Myron F. Mackoff to the 8th Subcircuit vacancy created by the recent retirement of Judge Sheryl A. Pethers. The appointment, which is effective December 29, terminates on December 3, 2018. Mackoff is a principal in the firm of Richardson & Mackoff. He was a finalist for Associate Judge in 2014. He has been licensed as an attorney in Illinois since 1994. 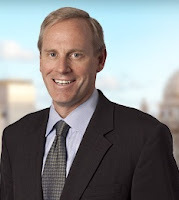 According to his firm biography, following his graduation from Northwestern University School of Law, Mackoff worked for several years in the Illinois Attorney General's Environmental Law Division. In 2002, Mackoff left the AG's office to join Hubert, Fowler, & Quinn, later known as the Hubert Law Group. After Donald Hubert's death, in 2006, Mackoff was chosen to wind down the affairs of the Hubert Law Group. Mackoff and Travis Richardson formed their firm in 2007. The Illinois Supreme Court yesterday appointed Litricia P. Payne, an Assistant Will County Public Defender, to the countywide vacancy created by the recent retirement of Judge Eileen Mary Brewer. The appointment, which is effective December 30, terminates on December 3, 2018. According to ARDC, Payne has been licensed as an attorney in Illinois since 1997. 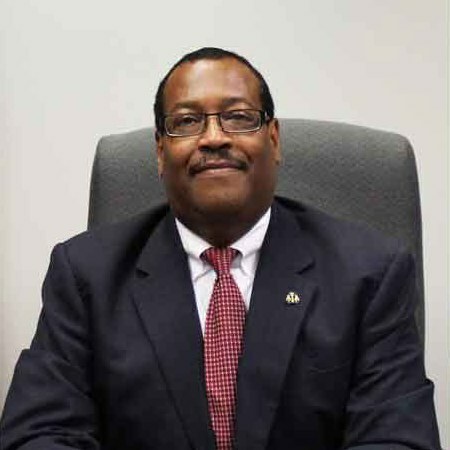 The Will County Public Defender's website reports that Payne is a Felony Courtroom Supervisor and a Mental Health Court team member in that office. She is a graduate of Loyola University Chicago School of Law and Illinois State University. Payne was in private practice before joining the Will County PD's office. According to the Will County PD website, Payne is a board member of the Black Bar Association of Will County. A 2008 article in the Chicago Tribune listed Payne as among the founding members of that group. Sure, some of you are still figuring out your New Year's plans; others among you are already worrying about what plans your kids might be making for New Year's. The rest of us are still trying to figure out our Christmas or Hanukkah schedules. But the Hispanic Lawyers Association of Illinois is thinking ahead. Past Noche Buena and Christmas, past Hanukkah (it comes late this year), past Kwanzaa, past El Día de los Reyes, past even the College Football Playoff. Yes, even beyond Super Bowl Sunday. Maybe, to paraphrase the seasonal song, maybe it's much too early in the game, but the HLAI is asking you just the same: What are you doing Thursday, February 23? As you'll note from the above 'Save the Date' notice, HLAI is looking for sponsors for the event. Contact Martin Quintana at mquintana@quintanalawgroup.com. Tickets can be obtained by clicking this link (and interested law students might want to buy tickets soon because only 25 tickets will be made available to students at $25 each). The Russians really are everywhere! Unless you've been in a coma, you're painfully aware that Russia is dominating the news these days. It started, of course, during the election campaign. There were allegations that the Russians were behind the Wikileaks disclosures of DNC emails. Mr. Putin, it seems, did not like Hillary Clinton... something about the "reset" button that she showed up with early in her tenure as Secretary of State. There was an entirely unsubstantiated rumor, which I probably just made up, that the reset button was, in reality, a thinly disguised "that was easy" button from the Staples commercials of some years back. Putin pressed the button and was so offended by the message, which he thought was directed at him personally, that he immediately started planning the invasion of Ukraine. I wasn't sure what the big deal was about the Wikileaks 'revelations' anyway. Many of these merely confirmed that the DNC rigged the primary process for Ms. Clinton and did everything possible to undermine Senator Sanders. But this was hardly news... all the talking heads on cable pretty much agreed that this was the official policy of the Democratic Party. Some were happier about it than others. And, though 'fake news' is much in what passes for 'real news' these days, the Wikileaks emails weren't fake. After Trump's unforeseen election, the Russian-mania amped up still more: The Russians stole the election! Trump has pooh-poohed the notion that the Russians helped him. It's a tempest in a teapot, perhaps, or a bubble in a bowl of borscht. It's pure coincidence that he proposes to appoint several officials in his forthcoming administration who have taken Russian gold from this oligarch, or that one. But persons from across the political spectrum, from the aforementioned Dr. Stein on the left to former Congressman Joe Walsh on the right, and many actually responsible people in between, from both parties, have called for an investigation of Russia's actions. Meanwhile, Russian hackers are turning up pretty much everywhere. Yesterday, for example, Rich Miller's Capitol Fax reported that the FBI told the Illinois Republican Party that the Russians had likely hacked some of its emails. But the topper, for me at least, came just this morning. Even when I have nothing to post, I try and check the blog every day. I never know when EP or Black Lady Who Reads or Lobo or THE PERSON WHO COMMENTS ONLY IN CAPS will have a new comment to share. I check my stats, too -- 2,902 page views yesterday -- the kind of number I used to see only in the few days before and after an election. So I was feeling pretty good about that. But only for a couple of seconds. The stats page also provides a map that shows a blogger where his or her page views are coming from. I generally don't pay much attention to mine: My map has always shown the United States in the darkest shade of green, meaning my readers are clicking in from somewhere in the United States. Although the map doesn't localize hits beyond that, I am highly confident that my readers are nearly all from Cook County. I met a Will County reader the other night... and I had to ask her... why? The Russians really are everywhere. 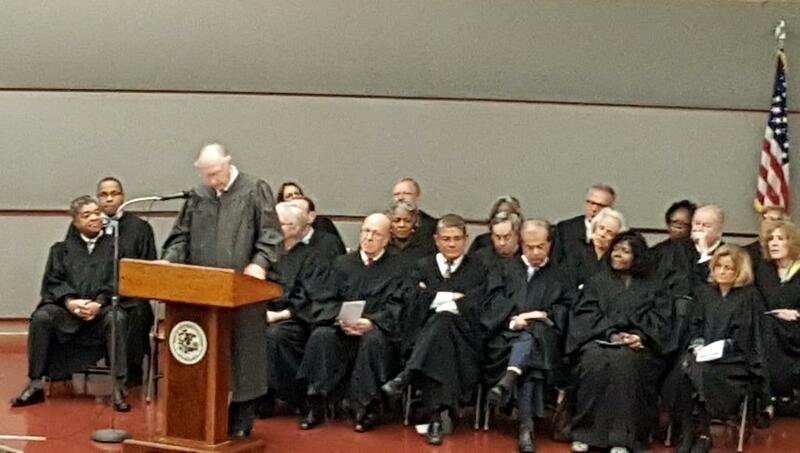 You may have to squint some to see it, but in the center of this photograph you can see Illinois Supreme Court Justice Charles E. Freeman administer the oath of office to Appellate Court Justice Bertina E. Lampkin, elected this November to the court on which she has served for several years pursuant to Supreme Court appointment. 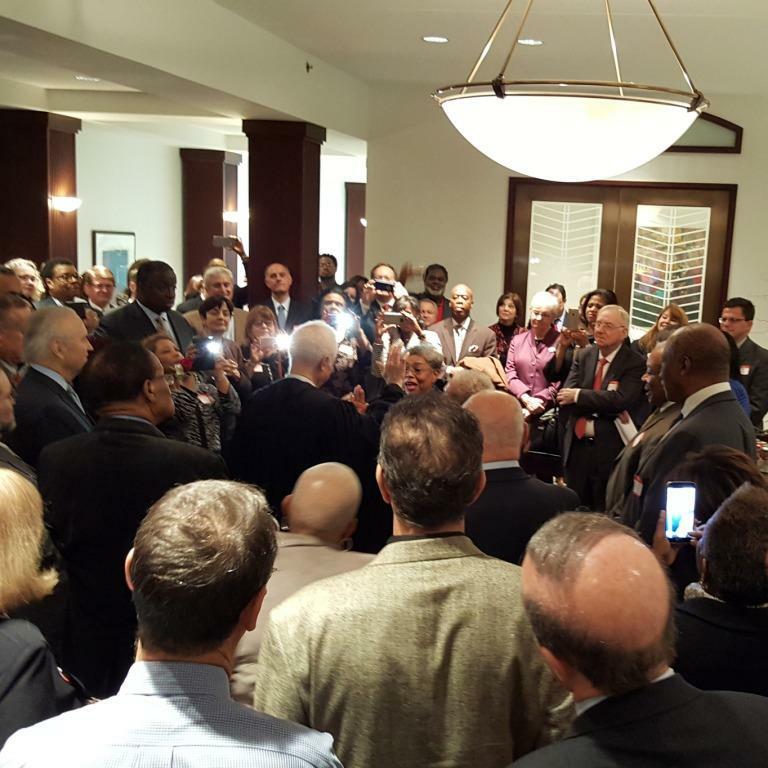 The ceremony was conducted yesterday evening at the Loop offices of Tabet DiVito & Rothstein LLC. Retired Appellate Court Justice Gino DiVito was among the speakers at the event. Also speaking were Cook County Chief Judge Timothy C. Evans, Circuit Court Judges Tommy Brewer and Leonard Murray, and attorney Kevin M. Forde. 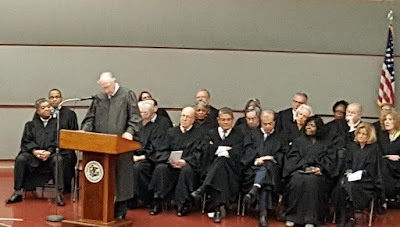 In addition to Justice Freeman, Supreme Court Justices Thomas Kilbride and Mary Jane Theis attended the event, as did retired Supreme Court Justice Benjamin K. Miller. Several of Justice Lampkin's colleagues on the Appellate Court were also on hand for the occasion including (but not necessarily limited to) Justices Cynthia Y. Cobb, Mathias W. Delort, Shelvin Louise Marie Hall, Nathaniel R. Howse, Jr., Mary L. Mikva, P. Scott Neville, and John B. Simon. If I missed someone, please excuse me: As the accompanying picture suggests, it was a crowded room. James Leonard Allegretti, Alison C. Conlon, Richard C. Cooke, Eulalia De La Rosa, Daniel Patrick Duffy, Jerry Esrig, Rossana Patricia Fernandez, Carolyn J. Gallagher, Aleksandra Gillespie, Carrie Hamilton, Maureen O’Donoghue Hannon, D. Renee Jackson, Marianne Jackson, Daryl Jones, Edward J. King, Steven A. Kozicki, Matthew Link, Anna Loftus, John Fitzgerald Lyke, Jr., Freddrenna M. Lyle, Mary Kathleen McHugh, Leonard Murray, Brendan A. O’Brien, Kevin Michael O’Donnell, Susana L. Ortiz, Jesse Outlaw, Patrick Joseph Powers, Marguerite Ann Quinn, Catherine Ann Schneider, Patricia S. Spratt, and William B. Sullivan were all sworn in today as Cook County Circuit Court judges. 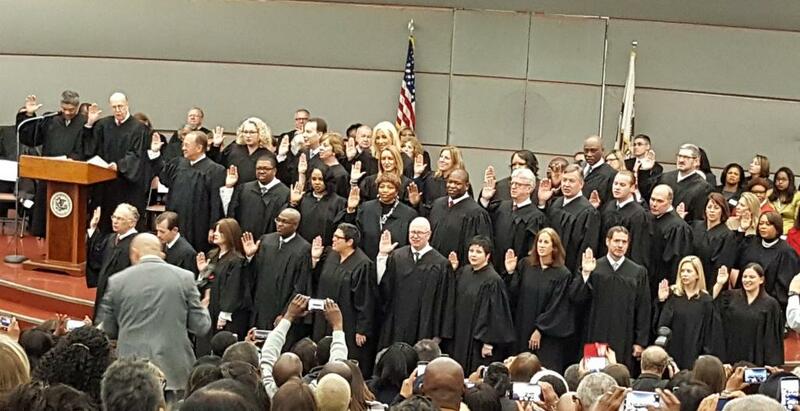 Cook County Chief Judge Timothy C. Evans and 7th Circuit Senior Judge William J. Bauer administered the oath. (Judge Eve Marie Reilly, who was also elected in November, was unable to attend today's ceremony.) Nearly half of the new class was already serving in the judiciary before today, either pursuant to Supreme Court appointment or as an Associate Judge. Several politicians and bar presidents were present to witness the occasion. 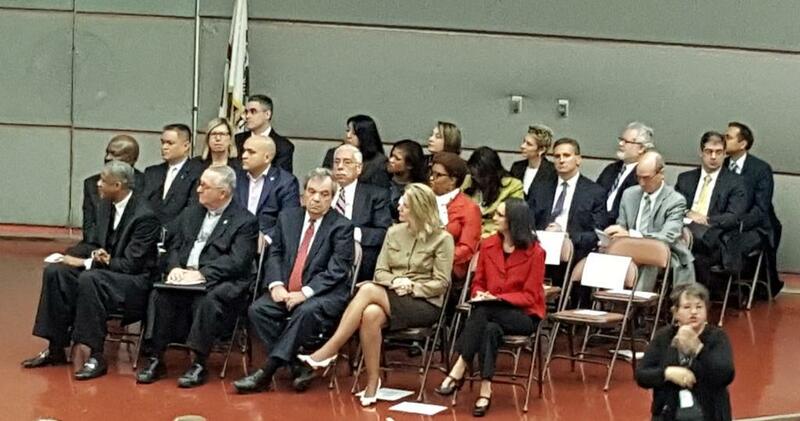 Of those in the front row, above, only Cook County Commissioner John Daley did not speak. From left, the Rev. Marvin E. Wiley of the Rock of Ages Baptist Church in Maywood gave the invocation, while the Rev. Mr. Daniel G. Welter, a Roman Catholic Deacon (and former associate judge) gave the convocation. To Mr. Daley's right are Cook County Public Defender Amy P. Campanelli and Illinois Attorney General Lisa Madigan. Both Campanelli and Madigan offered congratulations and advice to the new jurists. Also speaking at today's ceremony were Judge Bauer, Chief Judge Reuben Castillo of the United States District Court for the Northern District of Illinois, and Illinois Supreme Court Justices Thomas L. Kilbride and Mary Jane Theis. Judge Moshe Jacobius, who is the Presiding Judge of the Chancery Division, and the Secretary of the Circuit Court, called the roll of today's inductees. The Illinois Judicial Inquiry Board today filed a Complaint with the Illinois Courts Commission against Judge Valarie E. Turner, charging that she is "mentally unable to perform her duties." The JIB Complaint specifically alleges that Judge Turner has been recently diagnosed with Alzheimer's disease and suffers from memory loss. Turner, as FWIW readers know, was the Markham-based judge that let then-law clerk Rhonda Crawford don Judge Turner's robe and preside over some traffic cases. The Complaint does not ask for any specific relief from the Courts Commission, only that it "make such order in accordance with Section 15 of Article VI of the Illinois Constitution as the Commission may deem appropriate" (Section 15 of Article VI being the section of the Constitution that creates the JIB and Courts Commission, expressly giving the latter the authority, after notice and public hearing, to "retire a Judge... who is physically or mentally unable to perform his or her duties"). David Thomas has more in the Chicago Daily Law Bulletin (subscription required). On the recommendation of Justice Mary Jane Theis, the Illinois Supreme Court today appointed Patrick T. Stanton to the 3rd Subcircuit vacancy created by the retirement of Judge Maureen F. Delehanty. The appointment is effective January 1, 2017 and expires December 3, 2018. The Court's press release announcing the appointment can be accessed by the link in this sentence. Stanton has been licensed as an attorney in Illinois since 1993. He currently is a member of Dykema Gossett, PLLC. According to the both the linked firm biography and the Supreme Court's press release, Stanton serves as the firm's Lateral Recruiting Partner and is the former Managing Member of the firm's Chicago office. He began his legal career as a law clerk to U.S. District Court Judge George M. Marovich. Justice Bertina E. Lampkin will be sworn in Monday as an elected Justice of the Illinois Appellate Court (she has served on that court for several years pursuant to Supreme Court appointment). Justice Lampkin's elevation will create a vacancy in the 2nd Subcircuit (in addition to being elected to the Appellate Court last month, Justice Lampkin was simultaneously retained as a Circuit Court judge). The new vacancy won't last long. Judge Fredrick H. Bates, whose appointment to the countywide Walsh vacancy will end when Patrick Joseph Powers takes his oath of office Monday, was appointed yesterday by the Illinois Supreme Court to fill the Lampkin vacancy, effective December 5 (the new appointment will expire on December 3, 2018) (see corrected order changing effective date of appointment from December 6 to December 5). A Cook County Circuit Court judge, Arnette Hubbard, was recently singled out by WBBM-TV in an investigative report by Pam Zekman for taking 17 months of paid sick leave as a result of injuries allegedly sustained in an altercation outside the Daley Center in July 2014. The link will take you to Ms. Zekman's piece. Judge Hubbard was one of the judges retained in office at the November election just concluded. She was unanimously recommended for retention by the Chicago Bar Association and each of the member groups of the Alliance of Bar Associations for Judicial Screening. The evaluation process is confidential, so I can not tell you authoritatively that the bar associations were aware that Judge Hubbard had been off work for any extended period (whether 17 months or some, other, lesser figure) -- but I would bet a significant sum that this was indeed known, and explored by, the various bar groups before each group made their respective recommendations. The person involved in the altercation with Judge Hubbard, a man by the name of David Nicosia, was charged with aggravated battery and a hate crime as a result of this incident. He was acquitted of these charges this past August after a bench trial before Judge James Obbish. The implication of the Channel 2 report was that Judge Hubbard was not seriously injured in the altercation. However, the defendant's acquittal in the criminal case is not conclusive on whether Judge Hubbard was in fact injured or whether Mr. Nicosia is legally responsible for those injuries. Judge Hubbard has sued Nicosia for damages. She is represented by Power, Rogers, and Smith LLP in the 2016 Law Division case. Mr. Nicosia is represented by Breen & Pugh, the firm that represented him in the criminal case. This, presumably, is because Mr. Nicosia's insurer has asserted a reservation of rights and agreed to allow Mr. Nicosia to choose his own attorney to avoid a potential conflict of interests. 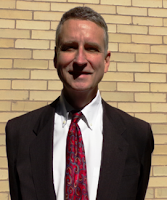 Criminal defense attorney Thomas M. Breen is prominently featured in Zekman's report. The Cook County Bar Association has issued a statement demanding an apology and retraction of the story from Channel 2. Nothing here advances the story in any particular; however, the Channel 2 piece about Judge Hubbard was recently raised in a comment submitted to this blog. So there are apparently rumors circulating; these are the known facts, as best as I can ascertain them. The 2016 Diversity Scholarship Foundation Unity Dinner and All-Bar Swearing In Ceremony and Reception is set for December 1 in the Grand Ballroom of the Chicago Hilton, 720 South Michigan Avenue. The Reception begins at 5:00 p.m.; the dinner and program follows at 6:00 p.m.
Tickets are $150 each (a table of 10 costs $1,500) are available at this link (there is a small service charge). Persons interested in sponsoring the event are invited to email dsfchicago@gmail.com. 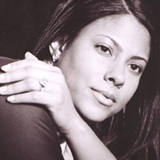 Persons to be honored at the dinner as Advocates for Diversity are Chasity Boyce, Diversity & Inclusion Projects Manager, Skadden, Arps, Slate, Meagher & Flom LLP; Hon. William J. Haddad (Ret. ); Tiffany Harper, Associate Counsel, Grant Thornton LLP; Cecilia Horan, Partner, Hinshaw & Culbertson LLP; and Hon. Jorge L. Ortiz, Chief Judge, Circuit Court of Lake County. An Access to Justice Award will be presented, in memoriam, to the late Appellate Court Justice Laura C. Liu. Illinois Secretary of State Jesse White will receive the Unity award and scholarships will be presented to 20 law student award recipients. It could be satire, of course. That would be the best case scenario. For some reason, satire is notoriously hard to separate from mere stupidity on the Internet. In fact, satire seems to attract stupidity; thus, every now and then, the North Koreans or the Iranians mistake a yarn on the Onion for a serious news story. The article in question here, "Is The Electoral College System For Choosing Our President Unconstitutional?" appeared in the Huffington Post. The Huffington Post is not the Onion. At least not intentionally, or all the time. So this makes the determination of whether this article is meant to be laughed at, instead of merely laughable, that much more difficult. And there really is a Professor Leon Friedman who teaches Constitutional Law at Hofstra University, in Hempstead, New York. He is pictured at left. And he's no adjunct, either; Friedman is the Joseph Kushner Distinguished Professor of Civil Liberties Law. That sounds impressive. Tuition at the Maurice Deane School of Law at Hofstra University is a cool $54,250 a year, according to this U.S. News & World Report web page. This, too, sounds impressive. According to Wikipedia, only 57.7% of the 2014 graduates of the Deane Law School had found "full-time, long-term, JD-required employment nine months after graduation." This seems less impressive. A possible partial explanation for this anemic statistic is suggested if the article was intended to be serious. Of course, it could be a case of stolen identity. Some jokester may have bamboozled the Huffington Post into believing that the Professor Friedman who contributes articles is the real Professor Friedman who teaches at Hofstra. As FWIW recently reported, there have been some fairly sophisticated identity appropriations out here in the Ether. On the other hand, the bio of the Huffington Post's Professor Friedman lines up fairly well with that of the apparently real prof.
At the risk of foolishly mistaking satire for seriousness, let's get this out of the way: The Electoral College can't be unconstitutional, because it is expressly provided for in the Constitution. Twice. First by Article II, Section 1, and then again by the 12th Amendment. You know, the Amendment drafted after the Election of 1800 resulted in a tie between Thomas Jefferson and Aaron Burr? While constitutional law professors on Long Island may not have much working knowledge of the original document, one would think they'd be conversant with that musical still playing on Broadway, Hamilton. Now, there might be an argument that the Electoral College has outlived its usefulness to the nation and should be abolished in the only way possible (for the benefit of any law professors in the audience, that would be by constitutional amendment). It's a bad argument, in my opinion, because the need to prevail in the Electoral College should force a candidate to seek support in a majority of the states, and not just seek majorities in the largest population centers. In this way a candidate must try and build a truly national consensus. This helps hold the nation together after a close national election. Also, properly functioning, the Electoral College serves as a mandate multiplier, which again serves the laudable purpose of bringing the nation together after a close national election. Most national elections are close. A few million votes, and only a few percentage points, separate the winner and loser. But---usually---the Electoral College turns that close result into a seeming landslide for the popular vote winner. No, that's not what happened this time. Or in 2000. Or in 1876. Or in 1824. But that's the whole list. And, in three of those four elections, third and/or fourth party candidates prevented the top vote-getter from achieving a majority of the votes case (the exception was Samuel Tilden in 1876; he had 50.9% of the vote). But, writes, Professor Friedman---or whoever really wrote that Huffington Post piece---"each Presidential vote in Wyoming is worth 3.6 times more than each vote in California." A graph depicting this same 'disparity' has been floating around Facebook of late. It is a dishonest, emotional argument: Wicked voters in backward, barbarian Wyoming outweighed enlightened voters in sunny, sophisticated California. 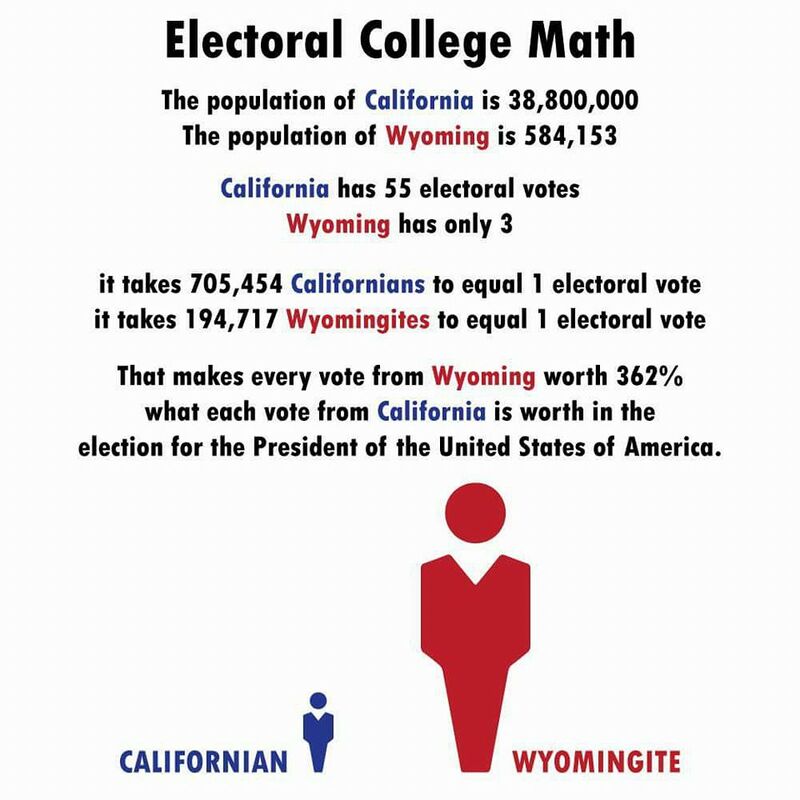 Here's how the Electoral College is actually put together: All states start with two electoral votes -- one for each senator. Each state's additional electoral votes comes from the number of representatives it has in the House. 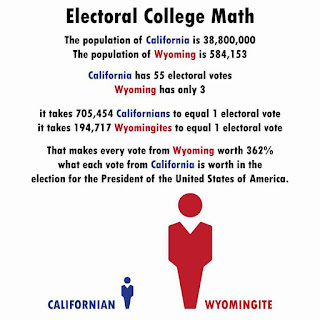 Wyoming has one representative for its 584,000 population; thus, it gets one more electoral vote, for a total of three. At the other extreme, California has 55 electoral votes -- for its two senators and 53 representatives. Each of the 53 House members in California represents, according to the numbers in the graphic, about 735,000 people. This is a discrepancy, yes, but not as great as the graph would suggest. And the discrepancy has nothing to do with the Electoral College; this is, rather, a function of the House of Representatives choosing not to grow with the national population. The size of the House is not a Constitutional problem. Article I, Section 2 of the Constitution provides only, "The Number of Representatives shall not exceed one for every thirty Thousand, but each State shall have at Least one Representative." Although the House was regularly expanded during the 1800s (from the original 65 reps in 1789) the size of the House has been capped at 435 since 1911 -- and a lot has changed in the past century. Texas is arguably even more shortchanged than California -- each of the 36 House districts in that state have a population of approximately 763,000. Montana has over a million people in its sole House district. Rhode Island voters would have more electoral college clout than voters in either Wyoming or California, according to the reasoning of Professor Friedman or the Facebook graph. Rhode Island has two representatives (thus, four electoral votes) even though its two districts have populations of only about 528,149. By contrast, each of Idaho's two congressional districts contains roughly 827,000 persons. So, Idaho's four electoral votes are worth 'less' than Rhode Island's. The Electoral College did not cause these discrepancies. These are caused entirely by the size of the House of Representatives. And all because of a law passed over a 100 years ago -- which, by the way, absolves both the Clintons and Donald Trump alike from responsibility. Nor is the Electoral College responsible for the fact that, according to respectable polls from all shades of political opinion, the candidates of the major parties this year were the arguably the least popular national candidates of all time. Neither was particularly popular in their own party. Their presence at the top of their respective tickets suggests major flaws in the presidential primary process, but not in the Electoral College. Certainly the primary process in both parties needs major, structural, fundamental reform. Maybe the size of the House of Representatives should be expanded while we're at it. But the Electoral College, whatever else its flaws may be, is not unconstitutional. If a 'distinguished' law professor was seriously arguing otherwise, we have a further illustration of why new law graduates, from any school, must take a bar review course to have any hope of passing any bar exam. The Illinois Supreme Court yesterday appointed personal injury attorney John A. O'Meara to a 4th Subcircuit vacancy created by the retirement of Judge James Riley. O'Meara's appointment is effective November 18 and terminates December 3, 2018. O'Meara is a partner in Curcio Law Offices. According to ARDC, O'Meara has been licensed as an attorney in Illinois since 1995. According to his firm biography, O'Meara began his legal career as an Assistant Corporation Counsel for the City of Chicago before moving to a "private law firm specializing in insurance defense" (Parrillo, Weiss & O'Halloran, although that firm is not mentioned by name in the linked bio). O'Meara joined Curcio Law Offices in 2002. I didn't think it possible that Trump would win. I dare say that most of the people who visit this blog didn't think it possible either. The polls said the popular vote would be close, but that Secretary Clinton would start out with a nearly insuperable advantage in electoral votes. Mr. Trump would have to win all the battleground states to have a chance at an upset. It looked like an early evening for the Clinton campaign---cute, I thought, that her party was in a room with a glass ceiling---was she going to break it, at least symbolically, at least some small part of it, during her acceptance speech? The real action, I thought, would be in the Senate races: How many Senate seats besides Illinois would the Democrats pick up? And then the vote counting started. Right now, in the morning, Ms. Clinton leads in the popular vote by 180,000 votes or so. The margin has widened in the last few hours. She was down by over a million when Mr. Trump claimed victory; she was up by 130,000 a few hours ago. The gap may widen or close some in the coming days; Trump may yet win a plurality when all the votes are counted. But ours is a federal republic, a union of states, and our chief magistrate is chosen by 538 electors, three from the District of Columbia, and the other 535 apportioned among the states according to their respective seats in Congress. Illinois has 20 votes in the Electoral College because we have 18 congressional districts and, of course, like every state, two senate seats. Mr. Trump carried enough states to ensure victory in the Electoral College, 289 votes so far according to CNN, 19 more than necessary for victory. With results in Michigan and New Hampshire and Minnesota still not complete, Trump's electoral margin may yet grow. Like many of you, perhaps, I watched a lot of the CNN coverage last night and into this morning. I found the county-by-county breakdowns remarkable... and very telling. If you click on the link, and go to the linked CNN website page, you'll see the map is interactive. You can see that Secretary Clinton's margin in Cook County was roughly 1.1 million votes. And she won the suburban collar counties, too -- yet her margin in the State as a whole is only 800,000 votes or so. The margin in California is 2.4 million votes, but the CNN map shows that most of it comes from the urban areas of San Diego, Los Angeles, and San Francisco. In an ordinary election year, the Electoral College functions as a mandate multiplier. There are few blowouts in national elections. In 1972, when Richard Nixon beat George McGovern, he had only 60.7% of the popular vote to McGovern's 37.5%. But Nixon won in the Electoral College 520-17 (a nominally Republican elector from Virginia cast a ballot for someone other than Nixon that year). In 2008, when Barack Obama defeated John McCain, Obama had only 52.9% pf the popular vote -- but he bested McCain in the Electoral College 365 to 173. This year, if Mr. Trump fails to regain the lead in the popular vote count, the Electoral College will not serve that mandate-multiplying function. Some will be tempted to call for abolition of the Electoral College because it 'frustrated' the 'will of the people.' But the genius of our system is that, to become President of this enormously diverse republic, one must win votes in the majority of states, not just supermajorities in a handful of urban areas. That should not be tossed away lightly. I will leave it to the pundits to explain why Secretary Clinton's "Blue Wall" crumbled and why a rich Manhattanite with clown hair captured the loyalty, or at least the votes, of so many blue-collar, or formerly blue collar, voters. Or why Ms. Clinton in 2016 underperformed Mr. Obama's 2012 results in jurisdiction after jurisdiction (even in True Blue Illinois). Of course, these would be the same pundits who assured us we would never have to face this day. Appointed Judge Carrie Hamilton will apparently hold her seat in the 12th Subcircuit. With only eight precincts still outstanding (233 of 241), Hamilton leads Republican David Studenroth, 67,138 to 63,836. Associate Judge Marguerite Anne Quinn is up 67,480 to 62,632 over Republican Thomas William Flannigan. On the other hand, Republican James Leonard Allegretti leads Democrat Janet Cronin Mahoney 70,687 to 60,485 and Republican Steven A. Kozicki leads James Edward Hanlon, Jr. 68,999 to 63,263. In the 13th Subcircuit, with 199 of 225 precincts reporting, Republican Kevin Michael O'Donnell is ahead of Judge Ketki "Kay" Steffen, 58,792 to 55,375. Republican Kevin Michael O'Donnell holds a 2,600+ vote lead over appointed Judge Ketki "Kay" Steffen, running as a Democrat in the traditionally Republican 13th Subcircuit. With 171 of 225 precincts reporting, O'Donnell leads 49,132 to 46,438. Click on the image to enlarge or clarify it. The Chicago Bar Association rated all 58 Cook County jurists seeking retention "qualified," recommending a "yes" vote for each. The Alliance bar associations largely agreed (there were a few judges receiving negative recommendations from this group of that one, but every single retention candidate was recommended by a large majority of the screening bar groups). It appears that Cook County voters have agreed. Every retention candidate appears to be comfortably ahead of the 60% + 1 threshold necessary to remain on the bench. 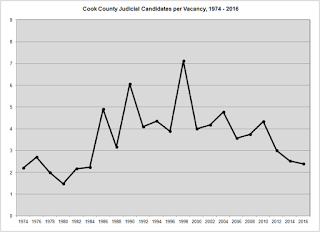 There are only five contested judicial races in Cook County, four in the north suburban 12th Subcircuit, one in the far northwest suburban 13th subcircuit. With just over 40% of the precincts reporting, in 12th Subcircuit races, Republican James L. Allegretti is holding a significant lead over Democrat Janet Cronin Mahoney. Judge Carrie Hamilton, a Democrat, is ahead of Republican David Studenroth. Republican Steven A. Kozicki holds a slim lead over Democratic candidate James Edward Hanlon, Jr. Associate Judge Marguerite Anne Quinn, the Democratic candidate, is leading Republican Thomas William Flannigan. In the 13th Subcircuit, with 87 of 225 precincts reporting, Republican Kevin Michael O'Donnell is leading appointed Judge Ketki "Kay" Steffen, the Democratic candidate. None of these leads are commanding at this point. In a press release issued last Friday, Illinois Supreme Court Justice Mary Jane Theis announced that her screening committee will review applicants for an upcoming vacancy in the 11th Subcircuit. Applications for the vacancy, which will be created by the forthcoming retirement of Judge Kathleen Kennedy, must be submitted by no later than 4:00 p.m. on November 28 (three weeks from today). Applications may be submitted electronically to lmarino@illinoiscourts.gov or by regular mail addressed to the Supreme Court of Illinois, Attention: Ms. Laurie Marino, 160 N. LaSalle Street, Suite N2013, Chicago, IL 60601. According to the press release, "Applicants who have previously applied for appointment to a vacancy must complete and submit a new application." To be considered, an applicant must be a resident of the 11th Subcircuit. For further information, or to obtain an application, visit www.illinoiscourts.gov and, from there, follow the instructions on the "Latest News" scroller announcing the Eleventh Subcircuit vacancy. This broke last night, but I didn't know how or where to find the Order. The Cook County Record had the link in a story by Jonathan Bilyk posted earlier this morning. The Order apparently does not prevent Crawford from being elected; rather, it says she may not take the oath of office on the first Monday in December if elected (as is likely) a week from today. On October 21, after the Administrator of the ARDC filed a Petition with the Supreme Court seeking an order suspending Crawford's law license, the Supreme Court entered an order directing Crawford to 'show cause' by October 28 as to why her license should not be immediately suspended. Crawford's response to that 'show cause' order asked for additional time (to November 11) in which to answer the 191-page Petition filed by the ARDC. Among other things, Crawford noted that she had only been served with the ARDC Complaint (that's one of the exhibits to the ARDC Supreme Court Petition) on October 13; one of her principal lawyers, George Collins, died the following day. Among other things, Crawford stated in her Response to the 'show cause' order, "To address concerns of adverse impact upon the public’s perception of the dignity and integrity of the judiciary, Respondent agrees to not oppose entry of an order that would delay her from assuming office as a circuit court judge until the disciplinary case has been resolved." That's a little different than agreeing to voluntarily forego taking the oath, as it was widely reported. On the other hand, Crawford said she needed more time to "to appropriately address the issue of whether the Administrator has presented grounds sufficient to warrant that Respondent be stripped of her law license without a hearing." This is what the Supreme Court said 'no' to yesterday. In a related Order, also entered yesterday, the Supreme Court granted the ARDC Administrator's motion for leave to amend the Petition against Crawford to include the criminal charges filed against her. FWIW readers have followed the story of Judge Maryam Ahmad's struggle to be a write-in candidate for the Hopkins vacancy in the 1st Subcircuit. According to Cook County Clerk David Orr's website and the Chicago Board of Elections website, Judge Ahmad is the only recognized write-in candidate for any Cook County judicial vacancy. If you write in anybody else's name in any judicial race, that vote won't count (see this 2012 post for an explanation as to why this is so). But if you've clicked the link on either the Clerk's website or the City's, you've seen a long list of names of candidates for President and Vice President (only presidential candidates are shown on the City list). About the only thing I could find out about Joann Breivogel is that she claims affiliation with the Republican Party of Illinois. I couldn't find anything out about Jonathan Lee, Kevin P. McKee, or David G. Stack at all. Roy Wayne Tyree apparently got three write-in votes in 2012; he seems to have run as a write-in candidate in 1992 as well. But I couldn't find out anything substantive about who he is or what he stands for. But your write-in votes for any of these candidates would count in Cook County. Other write-in candidates have tried to get their message to We the People. Darrell Castle (pictured at right) and Scott Bradley are the standard-bearers for the Constitution Party. Duff Cooper Smith A.K.A "Coop Smith" doesn't have a running mate. On his website, Smith says he'd let Congress choose his Vice President for him. He writes, "It is urgent for all of us that feel uncomfortable with the nominees of the major parties to consolidate our votes around Gary, Gill and myself, Coop Smith." I'm guessing that "Gary" is Gary Johnson, the Libertarian Party candidate (the Tribune's choice for President, if you'll recall). But who is Gill? I couldn't figure it out. Ben Hartnell, a high school history teacher and the candidate of the Harty Party, is campaigning to "Make America Bearded Again." His campaign website is electthebeard.com. Hartnell's running mate, Dave Marshall, is also his cousin. Tom Hoefling's campaign website describes him as "a long-time national conservative political activist, writer, publisher, organizer, and consultant. He is known primarily for his pro-life work and his defense of traditional marriage." Hoefling and running mate Steve Shulin, a conservative activist from South Carolina, are the candidates of America's Party. 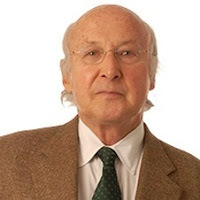 According to an October 24 post by Ben Casselman on FiveThirtyEight.com, Laurence Kotlikoff "is a Harvard-trained economist, a Boston University professor and, yes, a candidate for president." The linked article says Kotlikoff is actually on the ballot in Colorado and Louisiana. His running mate is UCLA Professor Edward Leamer. Leamer is not a listed write-in candidate. Kotlinkoff's campaign website is kotlikoff2016.com. Among other things, Kotlikoff says, "Traditional banking is unsafe at any speed." He promotes the Purple Financial Plan "to fix the financial system from scratch." Kotlinkoff describes his plan as "a 'show me' banking system that can't fail, even if Uncle Sam defaults, and is remarkably simple to implement." He claims that "[p]rominent economists and policymakers, including Bank of England Governor, Mervyn King, and former U.S. Secretary of Treasury and U.S. Secretary of State, George Shultz, have either strongly endorsed the plan or urged its careful consideration." Joseph A. Moldonado is the name one would have to write in in order to vote for Joe Exotic, a private zookeeper from Oklahoma, whose campaign website is joeexotic2016.com. The lion is not Moldonado's running mate; Douglas Keith Terranova is. Only Mr. Moldonado is listed as a write-in candidate, however. 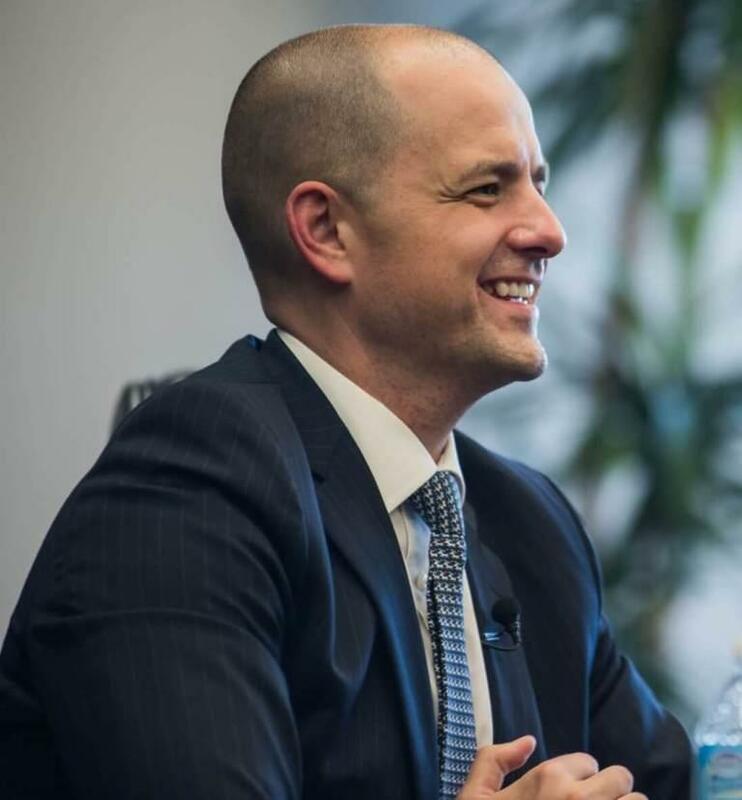 If the Washington Post may be believed, Evan McMullin has a chance to carry the State of Utah. The Post describes McMullin as "is a 40-year-old Mormon who spent a decade at the CIA and later became the policy director for the House Republican Conference." His running mate (not listed as a write-in candidate here) is Mindy Finn. McMullin's campaign website is evanmcmullin.com. Laio Morris has a campaign website describing her as a "write-in candidate for President of the Un-United States of America." She posts a more detailed biography on a campaign Facebook page. Morris's platform calls for abolition "of the credit system (equifax, transunion, experian)" and for elimination of individual debt ("wipe all credit clean"). Her "Project Fresh Start" proposes "supplemental income" of $5,000 a month "for those who are working, in school, has a business/wants a business, disabled or handicapped--certifications in consumer counseling, budgeting, investments and money management required." Matthew Roberts' stated goal as a presidential candidate is to bring "None of the Above" as an option to the ballot in every election. He had hoped to be listed as Matthew "None of the Above" Roberts in as many states as possible -- but, as FWIW has previously reported, Illinois law does not allow a candidate to use a slogan as a ballot nickname (Lar "America First" Daly couldn't run under that name under current law). But you can find out about Roberts' NOTA campaign by visiting his campaign website, noneoftheabove.vote. Write-in votes for Roberts will be counted in suburban Cook County, but not in the City of Chicago: Roberts did not file a write-in declaration with the Chicago Board of Elections. Similarly, write-in votes for Marshall Roy Schoenke and his running mate, James Creighton Mitchell, Jr., will count in the Cook County suburbs, but not in the City of Chicago. Schoenke and Mitchell bill themselves as "common men for an uncommon time" on their campaign website. Schoenke is a Lake County, Illinois native and lives in Lake Villa. Mitchell lives in Lindenhurst, Illinois. Phillip Seeberg is a Naperville resident. On his Facebook campaign page, Seeberg writes, "I don’t feel that I can vote for either Trump or Clinton, so I decided to vote for myself." Votes for Seeberg will count outside of Chicago, but any votes he gets in Chicago will not be counted. An article in the Naperville Sun (from which the accompanying photograph is taken) notes Seeberg "has self-funded his campaign with only $40, and refuses money from special interests, including his parents, because he said he doesn't want the hassle of filing paperwork." Write-in votes for James T. Struck are also valid only in suburban Cook County, not in the City of Chicago. It may not matter in his case, as he is, according to his website, already "copresident." Mary A. Vann filed nominating petitions as the presidential candidate of the Human Rights Party. But a challenge to her petitions knocked her off the ballot. She's a declared write-in in both the City and suburbs. Write-in votes for Demetra Jefferson Wysinger's presidential bid will count in the City of Chicago but not in suburban Cook County. Her campaign website identifies her as "the virtuous woman." Cherunda Fox is also a City-only presidential candidate. Based in Detroit, Fox describes herself on her campaign website, as an African-American and American Indian. For information about how to make sure your write-in vote counts, visit this page on the Cook County Clerk's website. From Texas, with humor. I don't know whether Mr. Daugherty is a Republican or Democrat. But not once does he accuse anyone of being in favor of (pick one) arming the criminally insane; bankrupting the State; pandering to criminals; hating women; selling out to Iran; or being a captive, toady, or alter ego of Speaker Madigan or Governor Rauner. Not one scary-shadow-face of the guy's opponent, whoever he or she might be. No ominous music. There have been two reasonably nice ads in the Illinois Comptroller's race, one each for Mendoza and Munger. Maybe there were others -- but they are lost in the surging sludge of vicious attack ads. In my opinion. Maybe this little gem is just a piece of flotsam in a sea of toxic commercials in this candidate's home market, too. I hope this commercial represents a step back from the brink. And I hope it finds imitators here. Thanks to Ken Levine for posting this ad last evening. Supporters of Judge Ketki "Kay" Steffen's bid to hold the seat to which she's been appointed in the 13th Judicial Subcircuit are planning a fundraiser for their candidate on Thursday, October 27, from 5:00 to 7:00 p.m., at Newland & Newland LLP, 121 S. Wilke Rd., Suite 301, Arlington Heights, Illinois. The event is hosted by Stephen Newland, Gary Newland and Donald Cosley. Event sponsors are John Russo, Hon. James Etchinham (ret. ), Dave Corbet, Ernest Blomquist, Mark Uteg, Larry Cohen, and the Ahmad Law Firm. Tickets are $50 apiece (tickets are $25 each for government employees). Sponsorships are also available (Bronze - $100, Silver -$250, Gold - $500). For more information about the event, or to reserve tickets, email rsteffen@steffenlaw.net. Walls closing in on Rhonda Crawford. What should the sanction be? FWIW readers following the Rhonda Crawford will recall David Thomas's article in the October 14 Law Bulletin about the ARDC petitioning the Illinois Supreme Court, seeking "a rule for Respondent, Rhonda Crawford, to show cause why she should not be suspended until further order of the Court or suspend Respondent on the Court's own motion, and restrain and enjoin Respondent from taking the judicial oath of office or assuming the office of judge, or take such other action as this Court deems just, for having engaged in conduct which threatens irreparable harm to the public, the legal profession and to the orderly administration of justice." Debra Cassens Weiss has updated coverage on the ABA Journal website. Last night on WGN-TV, I saw election attorney Burt Odelson (who is representing Crawford's write-in opponent, Judge Maryam Ahmad) stating that he has also filed a petition in the Supreme Court seeking to knock Crawford off the ballot. For public consumption at least, despite her indictment, Crawford is insisting that she's not going anywhere. If she is not forced off the ballot (as she would be if the Supreme Court suspends her license), Crawford is almost certain to win election on November 8. If I was advising Ms. Crawford---and, as you might expect, no one has asked---I'd be urging negotiation. I'd be looking for a soft landing. The price would undoubtedly be high---withdrawing her candidacy---but, at the moment Crawford's license and even her liberty is arguably at stake. No one---no one outside Crawford's defense team, anyway---is defending what Rhonda Crawford seems to have done in Judge Valarie Turner's Markham courtroom this past August. Putting on a judge's robe and deciding even the most insignificant of cases was a special kind of stupid thing to do. In a story posted last evening, the AP's Michael Tarm quotes Crawford's campaign as saying that Crawford is "'a pawn' in a behind-the-scenes play by 'Democratic Machine politics' to disenfranchise voters" in the 1st Judicial Subcircuit. Please. There may be a great many sins of omission and commission to lay at the feet of local Democratic Party leaders, but if anyone has disenfranchised voters in the 1st Subcircuit, it is Crawford herself. It is her own conduct that may yet force her off the ballot; if she stays on the ballot, and is elected by default, she will be unable to serve, at least for the foreseeable future, and quite possibly ever. Either way, the community's judicial choice will be frustrated -- and neither Chairman Berrios, nor President Preckwinkle, nor Speaker Madigan will own a particle of blame. But in determining the appropriate punishment, is our anger at Crawford's actions causing us to demand punishments that are disproportionate to the real harm caused? Of course, just as Ms. Crawford's ballot status is her negotiating chit, jail time is a pretty strong negotiating chit for those wishing Crawford would just go away. I hope Ms. Crawford's lawyers are talking to anyone they can. The Illinois Supreme Court appointed Judge Gerald V. Cleary to fill the 10th Subcircuit vacancy created by the pending retirement of Judge Donald J. Suriano (corrected order here). The appointment, which was made on the recommendation of Justice Mary Jane Theis (click here for press release), is effective November 3 and will terminate December 3, 2018. Judge Cleary currently serves pursuant to an earlier appointment, to the countywide Walsh vacancy, that will be filled in December by Patrick Joseph Powers. Cleary filed for that vacancy, but withdrew in December 2015, after his nominating petitions were challenged. Cleary previously sought a 10th Subcircuit vacancy in 2008. FWIW readers will recall that Justice Theis announced the Burke vacancy in the 10th Subcircuit; the Burke vacancy was subsequently filled with the appointment of Stephanie Saltouros. No separate screening committee was convoked for the Suriano vacancy, as the Supreme Court acknowledged in yesterday's press release: "Justice Theis recommended Judge Cleary's appointment after candidates were reviewed by bar associations and a special judicial screening committee for a previous 10th Subcircuit vacancy." Judge Suriano was elected from the 10th Subcircuit in 1996. He was slated that year, after two unsuccessful, unslated runs in 1992 and 1994. Ed McElroy, who died recently at the age of 91, was an advisor to a great number of judicial candidates over the years, walking them around, as the phrase goes, introducing them to helpful persons. Some won, some lost, but, from what I was able to observe in the last few years, even those who didn't win were better off, in terms of credibility for future races, than before they'd been taken under his tutelage. Obviously I did not have any contact with Mr. McElroy when I was running for judge. I didn't even know such people existed. But I met Mr. McElroy a few years back, through Avy Meyers, who always sang McElroy's praises. After that, on those few times I called Mr. McElroy about this candidate or that vacancy, he was quick to return my calls and answer my questions. As a blogger-and-or-amateur-journalist, I can offer no greater praise. But that's hardly an appropriate sendoff, so I'll link instead to Neil Steinberg's affectionate farewell. In case you missed it. Ed McElroy was not a lawyer. George Collins, on the other hand, was a lawyer's lawyer, as the Law Bulletin said in it's headline over Patricia Manson's October 17 tribute. According to Manson's linked article (subscription required), Mr. Collins had an extensive civil and criminal practice, representing "banks, schools, businesses and individuals." But it was his skill in professional disciplinary cases that vaulted Collins to the pinnacle of the profession. The lawyer or judge in a disciplinary jam was well-advised to seek assistance from Mr. Collins. ARDC Chief Counsel James J. Grogan is quoted in Manson's article as calling Collins a "giant," noting that he "was probably the most prolific" lawyer in terms of the number of ARDC cases he took on. I happened to be talking to Grogan last Monday, before Manson's article came out, and our conversation turned to Collins' passing (I'd not yet heard). While I hadn't contacted Grogan in connection with this blog, I don't believe I'm violating any rules of journalistic etiquette to note that Grogan spoke eloquently of the respect and admiration that he and his colleagues had for Mr. Collins. Mr. Collins's last trial, according to Manson's article, was before the Courts Commission in February (the Beatriz Santiago trial). He was representing Rhonda Crawford at the time of his death. Collins was among the recipients last month of the CBA’s Justice John Paul Stevens Award, which honors Chicago attorneys and judges who have shown the same public service and integrity Stevens showed in his legal career. In accepting the award, Collins did not talk about himself, his law partners said, but focused his remarks on Stevens. Friends and colleagues said Collins always focused on others. Collins fought hard for his clients, but never stepped over the line, [CBA President Daniel M.] Kotin said. “He was one of the greatest gentlemen that I ever met as a practicing lawyer,” he said. A campaign website has been launched for Thomas William Flannigan, Republican candidate for the Kazmierski, Jr. vacancy in the 12th Subcircuit. That's a link to the site in the preceding sentence; a link has also been added to the blog Sidebar. Flannigan's website stresses that he accepts no campaign donations -- but, the site notes, "contributions of time will be eagerly accepted. We need help sending out a campaign mailing, posting yard signs and other activities. If you would like to help please email us at Passport@prodigy.net." According to his campaign website, Flannigan is "one of a handful of American attorneys who speak Japanese fluently," and he has leveraged this skill into a niche practice advising American companies looking to do business in Japan or with Japanese companies. Before opening this practice, in 1993, according to this campaign website, Flannigan worked for a number of firms in Chicago and Tokyo, starting in 1985. Earlier in his career, Flannigan was a law clerk to Illinois Supreme Court Justice William G. Clark. 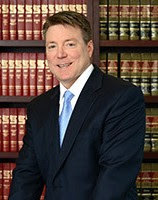 Flannigan has been licensed as an attorney in Illinois since 1983. He is married to Circuit Court Judge Ellen Flannigan. Dr. Klumpp ponts out trend about numbers of judicial candidates; what does this portend for 2018? A frequent and generous contributor to this blog over the years, Albert J. Klumpp, Ph.D., wrote in after seeing a comment on a prior post about the likely signature requirements for 2018 judicial hopefuls. The countywide signature requirement will be 3-4 times higher given the record turnout in 2016 due to the Clinton/Sanders contest. Some estimate it to be in the 6,500 to 7,000 range. In contrast, the signature requirement for 2016 was the lowest in recent history because of the pathetic 16% countywide turnout of 2014 attributable to the lame Governor's race. While many of the countywide candidates in 2016 submitted around 10,000 signatures, most of the non-slated candidates would have likely been tossed off the ballot if the anticipated 2018 requirement had been applied because most (if not all) did not have 6,500 GOOD signatures. Those professional circulators might net you 2,000-3,000 good signatures out of 10,000, but NOT 6,500. And even if the professionals start circulating all day from August to November, 20,000 legitimate GOOD signatures are hard to get and will cost you $20,000-$30,000 because they know they can charge a premium. The "real action" in 2018, Anonymous opines, will be in the subcircuits, with their lower signature requirements. "Over the last few election cycles," Dr. Klumpp concludes, "the lack of competitiveness in seeking judgeships has been nearing Machine-era levels." 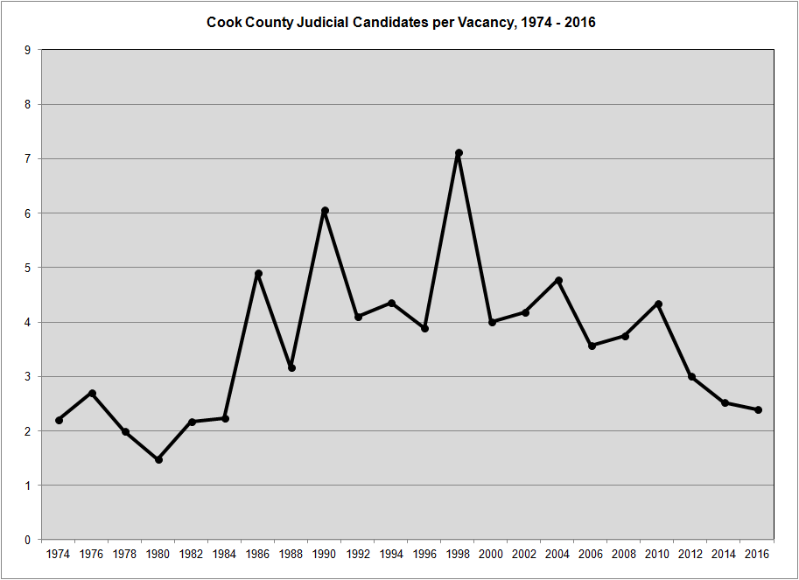 What is particularly baffling about these numbers, Klumpp adds, is that they include all candidates for every Cook County judicial vacancy except for the Supreme Court -- including all subcircuits after 1992 and city only or suburbs only prior thereto. In every election cycle I've covered here, there are some races that seem to attract a daunting number of candidates (though not all make it to the ballot) -- but FWIW readers know there are a great many uncontested races, even in the subcircuits. Dr. Klumpp says he has no explanation as to why the number of candidates per vacancy is dropping. I suppose the increase in required signatures in the subcircuits a few years back may have scared off some, but the signature requirements to qualify for the ballot in a subcircuit have always been (and remain) considerably less than the requirements for countywide hopefuls. The discrepancy should be particularly large in 2018: I don't know about the precise numbers suggested by the commenter, but I've no doubt that there will be a higher signature threshold for countywide Democratic judicial candidates. Even though the signature requirements would be much lower, I likewise doubt that there will be a sudden uptick in the number of Republican countywide judicial hopefuls. The Republican Party may or may not join the Whigs on the dustbin of history, a victim of Donald J. Trump, but, whatever happens, or doesn't, to the Republican Party this November, it is extremely unlikely to lead to a Republican revival in the County of Cook. But these may not be the only options for wannabee judges in 2018. Philip O'Connor's op-ed in last Tuesday's Tribune suggests that Republicans disgusted with Trump might still come to the aid of their party by voting for the Green Party presidential candidate, Dr. Jill Stein. Enough votes for Stein, see, and the Green Party might become an "established political party" -- able to field candidates with relative ease in 2018, thereby potentially diluting the Democratic vote, and thereby---*gulp*---helping reelect Gov. Bruce Rauner. Can you imagine Cook County judicial wannabees filing as Greens or Libertarians for countywide races in 2018? Well, it's easier to imagine than the Republicans fielding a Cook County slate, isn't it? There will probably be plenty of business for election attorneys in 2018 -- maybe even enough to significantly boost the number of candidates per judicial vacancy in 2018. Judge Marguerite Anne Quinn, Democratic candidate for the Kazmierski, Jr. vacancy in the 12th Subcircuit, was a recent guest on Avy Meyers' North Town News Magazine program and her interview has been posted online. NTNM airs Thursdays on CAN-TV at 7:30 p.m., and again on Fridays at 2:30 p.m. NTNM also airs on a number of suburban cable systems on Mondays. Check your local listings for air times. Meanwhile, with the permission of NTNM host and moderator Avy Meyers and his entire technical crew Sonny Hersh, you can watch the interview here. Janet Cronin Mahoney, Democratic candidate for the Mathein vacancy in the 12th Subcircuit, was a recent guest on Avy Meyers' North Town News Magazine program and her interview has been posted online. Earlier this week, the Chicago Tribune announced its endorsements for contested judicial elections and for the retention ballot. Typically, the bar groups identify a handful of egregiously incompetent judges. This year the Chicago Bar Association rated all 58 circuit court judges standing for retention "qualified." There are a smattering of negative ratings from the other groups -- the Council of Lawyers recommends a "no" vote on three -- but only one judge earned two negatives from among 12 bar groups. We asked around and could not find cause to single out any judge. If only this were the norm. We asked around and could not find cause to single out any judge? Because... we really wanted to single out somebody? Because we hate to say anything positive about the legal system? But, like I said, I'm probably oversensitive. In the races for the only five contested Cook County judicial vacancies, the Tribune recommends three Democrats and two Republicans. In the 13th Subcircuit, the Tribune recommends Judge Ketki "Kay" Steffen, the Democrat. In the 12th, the Tribune prefers Republicans James Leonard Allegretti and Steven A. Kozicki and Democrats Marguerite Quinn and Carrie Hamilton. Marguerite Quinn is an associate judge; Carrie Hamilton currently serves on the Circuit Court pursuant to Supreme Court appointment. And interestingly, if perhaps unusually, the Tribune has nothing bad to say about any of the judicial candidates in 12 or 13. But, do not despair, gentle reader. The Tribune has not gone soft. The editorial begins with the stunning revelation that Republicans don't field candidates in most judicial races, "so the contests are generally decided in the [Democratic] primary." Captain Obvious has joined the Tribune editorial board. As revelations go, this one is surely on the order of Captain Renault's astounding 'discovery' in Casablanca as he closes Rick's Cafe, "I am shocked -- shocked -- to find that gambling is going on in here!" For a "lesson in what's wrong with how Cook County's judges are chosen," the Tribune zeroes in on the Hopkins vacancy in the 1st Subcircuit, where Democratic nominee Rhonda Crawford was, until recently, unopposed. Recently, of course, Judge Maryam Ahmad (who lost a bid to hold her appointment to the 1st Subcircuit Brim vacancy in the March Primary) won a court battle to become a write-in candidate against Ms. Crawford. And the Tribune endorses Ahmad. Of course, in none of the 27 other uncontested judicial races is the nominee accused of pretending to be a judge without waiting for the formality of an election or the administration of the oath of office. So why is l'affaire Crawford illustrative of "what's wrong with how Cook County's judges are chosen" instead of an aberration? Judge Carrie Hamilton, Democratic candidate for the Tristano vacancy in the 12th Subcircuit, was a recent guest on Avy Meyers' North Town News Magazine program and her interview has been posted online. David Studenroth, Republican candidate for the Tristano vacancy in the 12th Subcircuit, was a recent guest on Avy Meyers' North Town News Magazine program and his interview has been posted online. Supporters of Judge Maryam Ahmad's write-in candidacy for the Hopkins vacancy in the 1st Subcircuit have planned an October 25 fundraiser for their candidate, from 6:00 to 8:00 p.m., at Truth Italian Restaurant, 56 E. Pershing Rd. Tickets for the event are $150 each, and sponsorships are available ($500 - Sponsor, $1,000 - Silver Sponsor, $2,500 - Gold Sponsor). Listed as co-sponsors of the event are St. Sen. Donne E. Trotter, Ald. Roderick Sawyer, Ald. Michelle Harris, Ald. David Moore, St. Rep. Elgie Sims, St. Rep Marcus Evans, Ms. Stephanie Coleman, Commissioner Howard Medley (Ret), Atty. Luke Casson, Atty. John Fotopoulos, Atty. Matthew Hurst, Atty. Burton Odelson, Dr. Phyllis Hayes, Dr. Angelia Roberts Watkins, Ms. Crystal Brown Black, Mr. Harold Davis, Mr. Leonard Noble, Ms. Peytyn Wilborn, and Mr. Craig Wimberly. For more information about the event, or to reserve a ticket, email electjudgemaryamahmad@gmail.com. The Alliance of Illinois Judges is planning a cocktail reception at GRK Greek Kitchen + Bar, 400 S. Wells St., on Tuesday, October 25, from 5:00 to 7:00 p.m. Tickets are $25 each (payable at the door) but reservations are requested by October 21. The admission price includes "hearty apps and drinks." To reserve a spot, click on this link (which will take you to an evite page). Organizers characterize this as the group's "inaugural" cocktail reception, with a view toward making it an annual one. Any proceeds from the event will be earmarked for an undergrad internship, allowing an undergrad to intern with a judge for a semester with pay. Steven A. Kozicki, Republican candidate for the "A" vacancy in the 12th Subcircuit, was a recent guest on Avy Meyers' North Town News Magazine program and his interview has been posted online. James Leonard Allegretti, Republican candidate for the Mathein vacancy in the 12th Subcircuit, was a recent guest on Avy Meyers' North Town News Magazine program and his interview has been posted online. James Edward Hanlon, Jr., Democratic candidate for the "A" vacancy in the 12th Subcircuit, was a recent guest on Avy Meyers' North Town News Magazine program and his interview has been posted online. 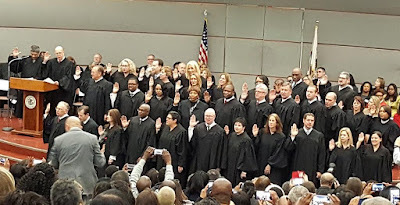 I present a guest post this morning from Susana Darwin, Co-Chair of the Judicial Evaluation Committee of the Lesbian and Gay Bar Association of Chicago and an Executive Committee Member of the Alliance of Bar Associations for Judicial Screening. If you are excited about the top-of-the-ballot races in the November election, please don’t forget to cast informed votes in down-ballot races, like those for the judiciary. If you can’t bring yourself to vote one way or another in the top-of-the-ballot races, you can take comfort in the difference your vote can make in down-ballot races. In either case, please see http://tinyurl.com/judgesgen2016-1 for recommendations for Cook County judicial races from the Alliance of Bar Associations for Judicial Screening. A candidate for retention must win 60%+1 votes to remain in office, so the question for 2016 is: how does a voter cast a principled vote on judicial candidates? In 2016, no sitting Cook County judge or appellate court justice earned universal or even majority “NO” retention recommendations from the eleven groups that comprise the Alliance. In fact, five bar groups – the Asian American Bar Association of the Greater Chicago Area, the Decalogue Society of Lawyers, the Hispanic Lawyers Association of Illinois, the Puerto Rican Bar Association of Illinois, and the Women’s Bar Association of Illinois – recommend YES votes for ALL retention candidates. Given the ratings of those five bar groups, a voter could credibly vote YES on all retention candidates. By contrast, research shows that over the years, 20% of voters cast NO votes on ALL candidates. Every judicial candidate before voters in November has been on the bench for at least six years, some for many more years than that. Many have earned the respect of their colleagues and the lawyers and litigants who appear before them, and the experience they have developed while serving the public should not be lightly discounted. In the last two scenarios, whether to cast YES votes for other candidates depends on the voter’s wish to affect the total number of votes a candidate gets, and therefore, how close to the required 60%+1 to remain in office. Not casting a YES vote for a particular candidate shrinks the total number of votes that candidate tallies and empowers all-NO voters’ votes.